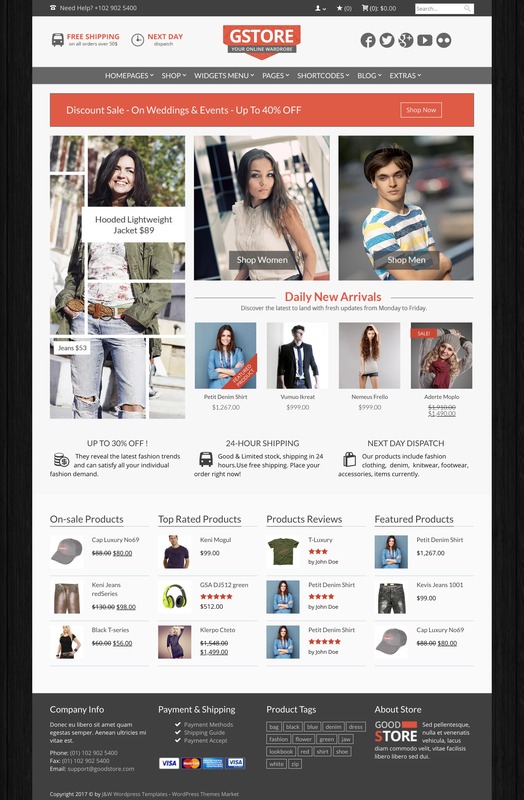 GoodStore is a woocommerce which gives a strong feeling of a reputable online shop. It contains 22 layouts and you can choose between a wide or a boxed theme size. The logo is well placed at the top left of the header and also on every product page on the right. The product pages contain Color/size drop-down menus and the reference. It is followed by the description. The theme is available in 14 languages including Dutch, French, German, Italian, Norwegian, Spanish, Swedish, Portuguese, Russian. This theme is compatible with WPML and WPbakery. There are also filters by price, color and size. I think this is a good theme for a fashion store, a clothing line, a clothing shop.